Successful events require a high degree of organization and time management skills, not to mention impeccable attention to details. Having to plan and manage several events at the same time requires super-human powers or the FileMaker Platform. Success is measured by numerous factors including attendee participation and their perceived satisfaction, amount of donations, overall loyalty to university events, etc. UCB wanted to centralize all of the details of their events so that organizers and administrators can easily access important information about their events such as invited guests, attendee type (alumni or donor), responses, etc. This information helps the staff to prioritize follow-ups in order to maximize attendance and ultimately donations. It was time that the UCB staff applied their organizational skills to improve their event planning processes. The system users are comprised of two groups, the department assistants and the fundraisers. The department assistants work on-site at the university and maintain the event data. Fundraisers are remote staff who manage the event logistics. These two groups work closely together to produce successful events. 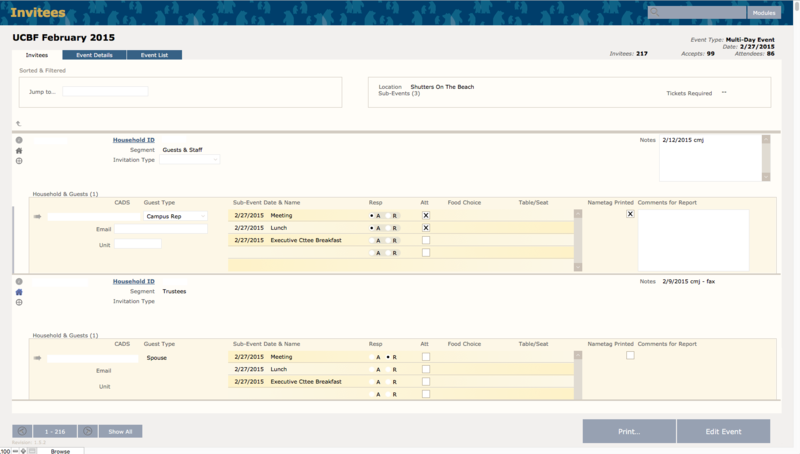 Prior to the FileMaker Platform, department assistants created an individual database to manage each event. The database housed all of the relevant information about the event and invited guests. As new events were organized, the department assistants would create a new database for the events simply by copying an existing database. The university inevitably had a library of several databases representing the different events that they hosted. Spreading information across different databases makes it difficult, if not impossible, to effectively provide any perspective or statistics about the events and attendees over time. The Support Group created an event management solution using the FileMaker Platform to centrally capture and track all of the university's events each year. Rather than creating or copying a new event, the department assistants simply import guest lists from their backend system. Events are distinguished by type within a single database. Based on the event and guest information, labels, seating charts, name tags, etc. can be created and printed. The system can also manage food preferences and details for multi-day events. One of the system's primary features is a web-based interface, which the remote fundraisers use to view event details and download attendee reports. 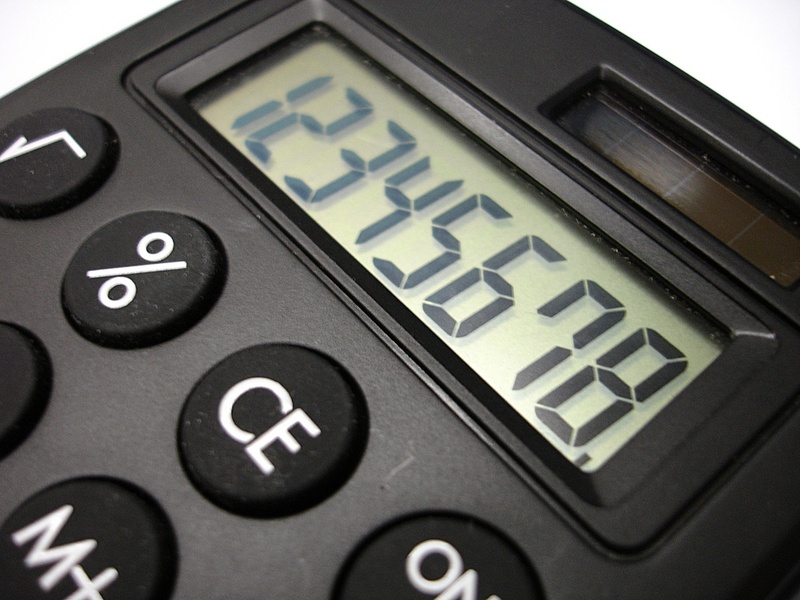 Previously, they would have to contact the on-site department assistants in order to collect this information. The new system gives the fundraisers the independence and flexibility to manage the logistics in their own way. Working with The Support Group and their team (Karstyn McCoy and Nick Chapin) continues to be true partnership. From onset of the project in which they created a database that encompasses all of the elements we need to produce our events to problem solving when the database seems to be a bit quirky. They are friendly and very responsive to our needs and questions. My overall experience with the support team has been more of a collaborative one rather than one of client-vendor. It has been and continues to be a rewarding partnership. The FileMaker event system makes it easy for department assistants to track both current and past events. 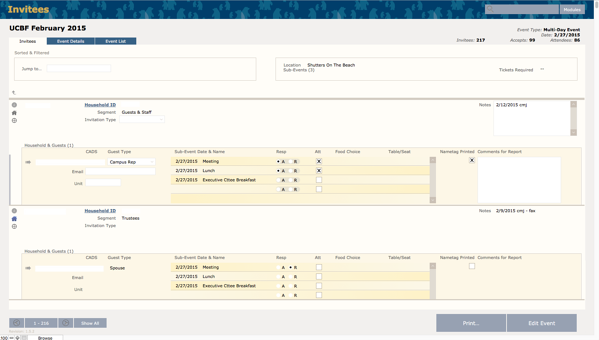 Having one database for all of the events offers insight about all the university's events and removes redundant tasks. And, the ability to review and learn from previous experiences makes it possible for them to plan events more efficiently. Now that fundraisers have remote access to event details, they are able to optimize their time and efforts more effectively with the FileMaker system. They are autonomous and self-sufficient. In addition to helping to manage event logistics, the FileMaker event system saves the university time and space by consolidating data into a single database. The system also saves time for the department assistants and fundraisers. They quickly embraced the new system. It helps, that it was very easy to learn and meshed seamlessly into the process. This project is a perfect example of why FileMaker shines as a Workplace Innovation Platform. Download a PDF version of this FileMaker Platform customer success story. We've been developing custom apps and offering FileMaker consulting services for more than 30 years. Read more of our Customer Success Stories and feel free to contact us to learn more about our custom software development services or schedule a free initial consultation.